While the Beyerdynamic DT 3's technical specifications are equivalent to those of the Beyerdynamic DT 2, the DT 3's neckband makes it very comfortable to wear whenever an over-the-head headset (like the DT 2) is not wanted. The Beyerdynamic DT 3 also has a nice long cable, at 1.6 m.
The Beyerdynamic DT 3's basic technology was developed to coordinate perfectly with the Synexis RP8 pocket receivers in our line of Beyerdynamic tour guide systems. Used with the RP8, the DT 3 conveys speech very powerfully and clearly. The DT 3's frequency response has been adapted to match the human voice, but it's also great for rendering music or video (when our tour guide systems are used during a presentation, for example). The DT 3 is a neck-worn headset. It may take a little getting used to, but it protects a person’s hairstyle and is much less noticeable in press photos than a standard over-the-head headset. We gladly offer the DT 3 as a complimentary option when you rent our tour guide systems for your event. It's not just for standard guided tours; our conference technicians like to employ the DT 3 in presentations and when interpreters are used. Still, our customers tend to prefer the DT 2, because it’s the more comfortable headset. In the final analysis, the choice between the DT 2 and DT 3 is a matter of taste, because the headsets are identical when it comes to audio performance. Needless to say, we clean and disinfect the Beyerdynamic DT 3 after each production and replace the headset's foam earpads. The DT 3 you get from us will have been freshly tested and shrink-wrapped. Our tour guide system/conference equipment team will be happy to advise you as you choose the best headset for your application. Members of the Beyerdynamic DT series (DT 1, DT 2, 3) are the standard headsets used in our tour guide systems. But we're also radio professionals, so we can offer custom headset solutions as well. 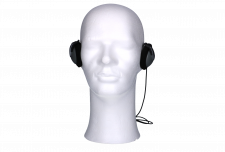 These can range from noise-cancelling headphones to our Helicopter Headset, helpful in motor-sport venues, for example. Tour guide system team: Phone +49 30 29381970; e-mail mail@Radio-Rental.com.